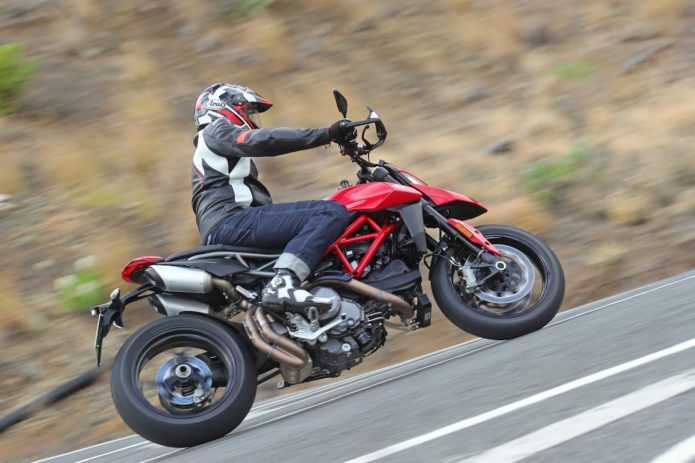 Say the word supermotard, and my thoughts are far from all-day ergonomics and manageable power. I think power wheelies. Backing it in. Sacrificing comfort to satisfy a hooligan need. The first two generations of Ducati Hypermotards—the 1100 and 821/939—are ultimate hooligan bikes. The third generation begins with the 2019 Ducati Hypermotard 950. It retains the hooligan soul, but with some much-needed elements for the everyday rider. I headed to the Spanish tourist town of Maspalomas on the island of Gran Canaria in the Canary Islands off Africa’s northwest coast to test the new Hypermotard 950 on the streets, and the higher-spec Hypermotard 950 SP on the short and tight Circuito Maspalomas.